ABOUT OUR WEB-SITE "SOBORNAYA STORONA"
Name - Internet Anthology "Sobornaya Storona" (Land of catholicity). Registered in the Ministry of press, broadcasting and mass communications of the Russian Federation. Major anthology divisions: "Staraya Russa land", "Path to the church", "Dostoyevsky's city", "Wonder-working icon", "Torches of Orthodoxy", "Society of antiquity lovers", "Legends, traditions, fairy tales", "Time machine - Archeology", "Bow to your ancestors", "Echo of the War", "Father Ilmen", "We say like this", "Fates of names", "Folk crafts", "World of music, songs, traditions", "Heroes of faith make Russia strong", "Childrenland", "Leafing through papers and journals", "Lyric line", "City inquiry office", "News". Towns Staraya Russa and South Priilmenie at all times were keepers of national traditions that manifested in the historical geography and area reclamation, in the abundance of archeological, historical, cultural and architectural monuments, in everyday life, customs, traditions, way of life and hospitality of the Rushans. Now that we stepped into the new century and new millennium, it is especially important to revive historical memory of generations, give strength to the people's conscience and restore ruinous, lost or dilapidated sanctities of the Staraya Russa land, symbols of its spirituality, moral purity and strength. Internet anthology "Sobornaya storona" was founded as an enlightening, educational and informative edition, taking an active part in the revival of culture in our common Motherland, Russia, and Staraya Russa land of Novgorod region, small Motherland. Russian people will overcome disorder of the world only thanks to the knowledge and careful preserving of its rich and eventful history and faith in God. Staraya Russa is a museum-town, resort-town, warrior-town, town of Feodor Dostoyevsky. 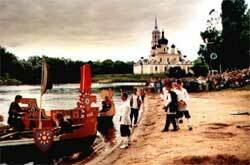 The Staraya Russa land is a treasury of spiritual values, historical traditions and experience of old masters. Day by day "Sobornaya Storona" gathers and renders to you, our dear compatriots, this invaluable historical memory of generations. Like some clever man has recently said, Internet users are paratroopers from the future, sent to us to help the future to come true. Year 2002 (like the entire century) will be the year of information technologies. We hope that they will help Russia in overcoming hardships and trials, to fully and readily assimilate historical, cultural and spiritual traditions of the past, that they will help our children and grandchildren to grow as genuine and faithful patriots of their Fatherland! It may and should happen only under the condition of information freedom and glasnost. 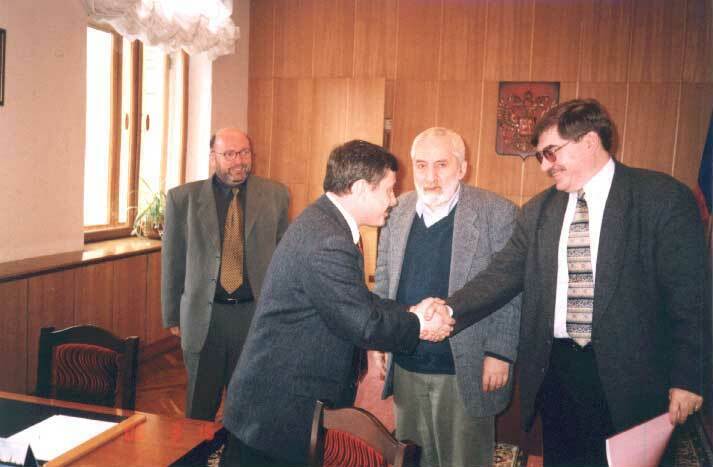 Only during the first year of our Internet-anthology from October 2000 till October 2001 it was visited by over 10 thousand people, and many of them became permanent readers of "Sobornaya Storona". Our readers live in 300 cities of 92 countries, the majority - in Moscow, Veliky Novgorod, St.-Peterburg, Novosibirsk, Ekaterinburg, Stavropol, Tomsk, Minsk, Kiev, and some in the USA, Canada, Germany, Latvia, Australia, France, Belgium, Great Britain and other countries. In the first year of its existence the anthology rated among the first hundred of the best Russian Internet-sites on history and local studies, shifting in the beginning of 2002 from 50th to 25-30th place in the Yandex' rating. Printing all pages in 20 topical divisions of our anthology about history and archeology of Staraya Russa land, sanctities and heroes of faith, folk crafts, talented Staraya Russa painters, poets, musicians, teachers, museum members, researchers of local lore and historical relics, Staraya Russa as a city of Dostoyevsky, warrior-city, toiler-city, resort-city, would make a 8 000 pages thick book, containing over 800 color and black-and-white pictures - photos and drawings. The reason for naming the Anthology "Sobornaya Storona" is the following. From old times till today one of the most beautiful historical districts of the city is called Sobornaya Storona, with its spiritual and architectural dominant - the central church of Staraya Russa - The Voskresensky (Resurrection) Cathedral of the XVII century, standing at the confluence of the Polist and Porusie rivers. 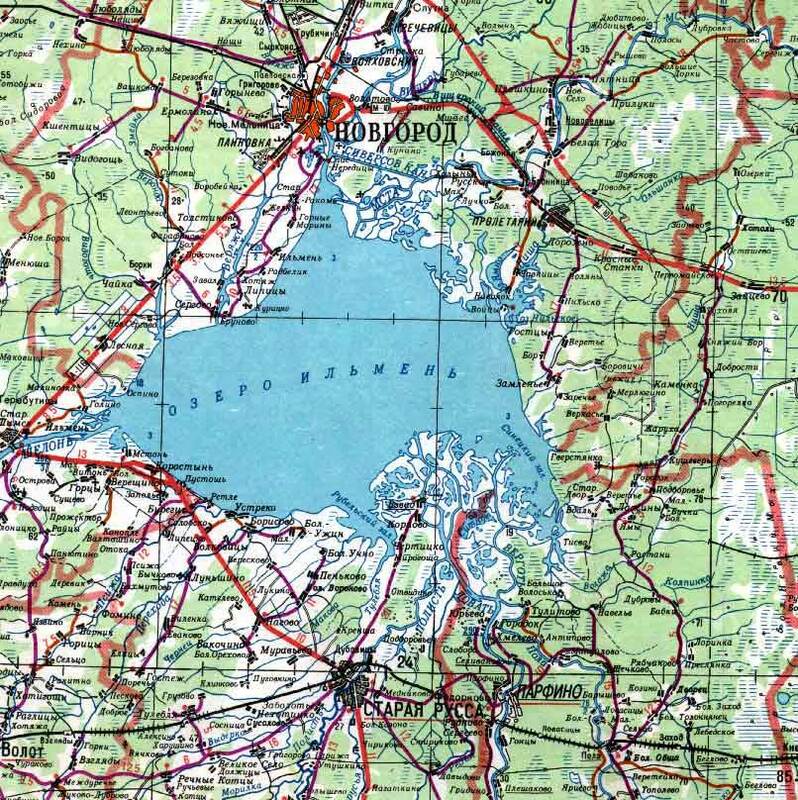 That is why such a geographical name like "Sobornaya storona" appeared in Staraya Russa. In the old Slavonic language the word SOBOR in addition to the meaning "main city church" and "conference of pastors of Christ's Church" had one more meaning: "meeting of the believers on the second day of a feast to glorify the person, who played an important role in the commemorated event, e.g. Synaxis of the Most Holy Theotokos." Time passed and the derivative of this word "SOBORNY" brought also the meaning "common, related to everyone, national, public" in our speech. In connection this I would like to underline: we have chosen the name "Sobornaya storona" for the anthology not only as an important historical and cultural symbol of Staraya Russa and its visual image, but rather as a symbol of spiritual unity and common work for the sake of revival of the city. Development of Staraya Russa and its land on the basis of historical generation memory, spiritual values and experience of ancient Russian masters, search of necessary solutions and funds for their realization, intensive spiritual enlightenment and informative activity are the top priorities of the Internet-anthology "Sobornaya storona" and its Moscow subsidiary of Staraya Russa's countrymen. We remember wise words of His Holiness Patriarch Alexey II of Moscow and all Russia, said in 2001 in the Holy Trinity St.Servius Laura on the feast of Pentecost: "Let us recall the prokimen of the Pentecost vespers: "What god is as great as our God? Thou art God who workth wonders". Indeed, God works wonders, and we become witnesses of these wonders that we see with our own eyes occurring in our life. Could our predecessors even think 20-30 years ago that faith in Christ would revive in Russia, that churches would be restored and new ones built, cloisters opened, that the sanctuaries destroyed in the past would live again? It is the mercy that the Lord manifests to us. And we have to be his faithful servants and followers and bear the ministry entrusted to each of us worthily and honestly knowing that the Lord is with us." Dear Staraya Russa people and all the residents of Staraya Russa town saved by God! Dear guests of Novgorod land! Turning to prayer intercession of the Mother of God, pouring out our sorrows and joys before Her long-prayered wonder-working Staraya Russa icon, we receive consolation and help. May the Queen of Heaven preserve us! May the Queen of Heaven help us in our good deeds and cover our Staraya Russa land with her pall! Pour Your grace, our God, on our Fatherland, Russia! ...Staraya Russa. Many historians associate the name of the ancient Russian State - 'Rus' - with this town. Supposedly, the definition "Staraya", or, "Old", proved the fact that the town Russa was older than the new town - Novgorod. But, unfortunately, this version which is so much flattering for the heart of each Russa dweller, have not been confirmed by the written sources. From 12th to 16th century in the name of the town there was only one letter 'S'. And, only when there appeared other 'Rusas', the town with this name located in Novgorod province started to be called "Staraya Rusa". A hundred years later, the word Russa started to be spelled with double 'S'. The first record of this town in the annals dates back to the year 1167, when the prince Svyatoslav was exiled from Novgorod. Further records in the. written sources reflect the events that took place in the end of the 12th century. 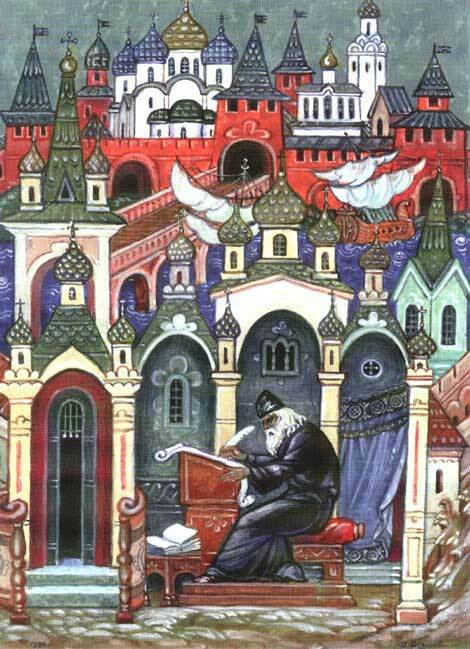 There, Russa was already represented as ' the established town, with housing, network of streets, squares, and churches. But let us go back to the moment of formation of the town. If historians cannot help us, then let's resort to the legends. The most known one was written in 17th century. Two warriors, brothers Sloven and Rus, as they moved far to the North from the Black Sea area, had been looking for quite a long time for a good place for settlement. At last, they saw a beautiful lake. They named it Ilmen, after their sister. And, by the advice from the Magi, the elder brother founded the city, Slovensk-the-Great. 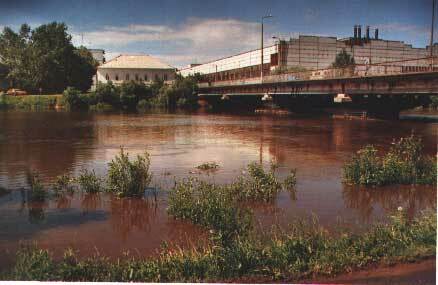 And, he named the river 'Volkhv', to commemorate the wise Magi, or, Volkhv, in Russian. The younger brother founded the town Rusa at the confluence of two rivers. And, named those two rivers 'Polist' and 'Porusya', after his wife and daughter. The legend does not say anything about the native population. However, these lands had been populated already in the 2nd millennium B.C. 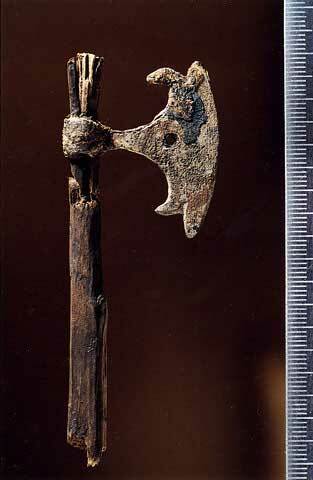 The findings of first archaeological expeditions of thirties and fifties have proved that. So, on the place where the Resurrection church in Staraya Russa is now located, the remnants of residence of prehistoric man have been found, - the stone axe dating back to the late Neolithic period, a piece of flint, a fragment of ceramic pottery. Maybe, the first dwellers in these picturesque places were attracted by the mild climate. Winter, though long, is not cold. Summer is relatively warm, with prevailing sunny days. Rivers and lakes rich with fish, forests full of wild animals and birds. 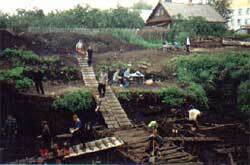 The Finno-Ugric tribes used to live here in prehistoric time. They made their living at the expense of the natural resources of the area, without any embellishment or change of the original nature. Everything changed with the coming of Slavic tribe headed by Sloven and Rus to these virgin lands. The newcomers were more advanced. They were not satisfied with little. They started to construct the town of log houses. They started to make salt, the queen of spices in medieval times, from the natural salty springs which were abundant here. Saltworks opened the glorious page in the history of the ancient town on Polist' river. And, now we are going to narrate about it. 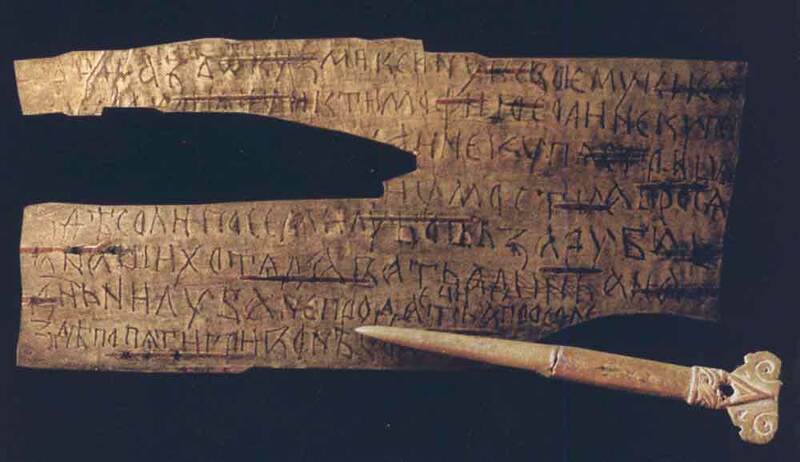 Birch-bark letter from Staraya Russa, XIII c.
... Undoubtedly, it was exactly the saltworks that developed the town. Expeditions have found the remnants of evaporating kilns and salt trays in the earliest archaeological layers. Saltworks became the basis of the economy of Staraya Russa and the main occupation of its inhabitants for many centuries. In ancient times, salt was the commodity of strategic importance. Merchants offered 12 measures of wheat for 1 measure of salt. Natural mineral springs on the southern shore of the lake allowed to extract salt with least cost and in considerable volumes. 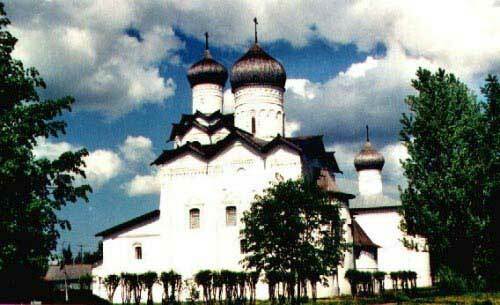 Owners of Staraya Russa saltworks, princes, boyars and monasteries, made big profit from sales of salt. The richest and most influential people tried to get possession of saltworks in Rusa. The salt springs were not less valuable than the gold deposits. 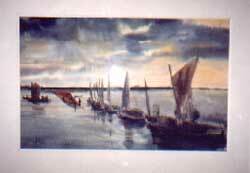 Low-cost salt and convenient geographical location of the town promoted development of trade. Here passed waterways connecting the Baltic, the Black and Caspian seas. Salt attracted merchants from Denmark, Baltic states, Poland and Asia. The famous waterway "from Varangians to Greeks" passed through Staraya Russa. Apart from salt, the traded merchandise included wax, honey, fat, flax, hemp, tar, furs, handicraft items. The written sources narrate, and archaeological findings prove that by the end of 12th century Rusa was the established rich town. The scholars studying the region say that on the place where the most ancient Our Savior's Transfiguration church is located, there used to be the first temple built by Christians. It was made of wood. In May, 1198, the foundation of the stone church was laid. It took only 70 days to build the temple. 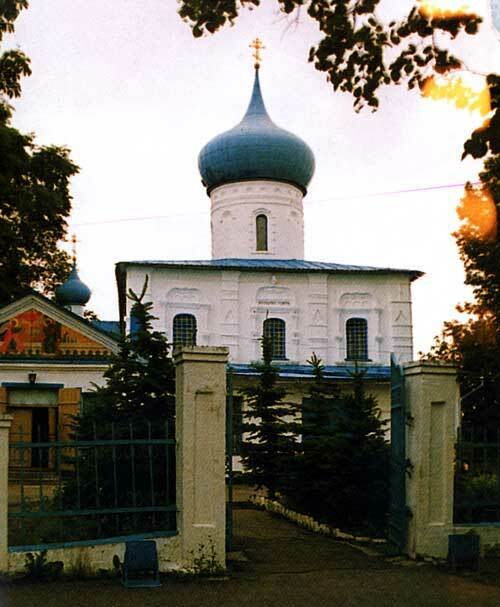 22 years later, the Kosinsky monastery was founded. Unfortunately, now this architectural monument of the 13th century is abandoned and deteriorating. All inhabitants of the town are looking forward to the revival of the ancient sacred temple. The first steps towards this are made at the expense of voluntary contributions. In 14th dud 15th centuries Rusa achieved its peak of economical development. Salt output then was several hundred tons per year. By the end of 15th century the town area exceeded 200 hectares. By its population and number of households the town ranked fourth among all Russian towns, going after Moscow, Pskov and Novgorod. Excavations on Borisoglebsky site , XII c.
At the turn of 70-ies of 19th century, because of the competition from cheaper salt from Volga and Kama regions, the Staraya Russa saltworks started to degrade. 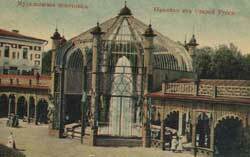 But the generous gift of Mother Nature - the mineral springs - did not allow the saltworks town to perish. From the middle of 19th century, Staraya Russa bесamе known as the resort town. 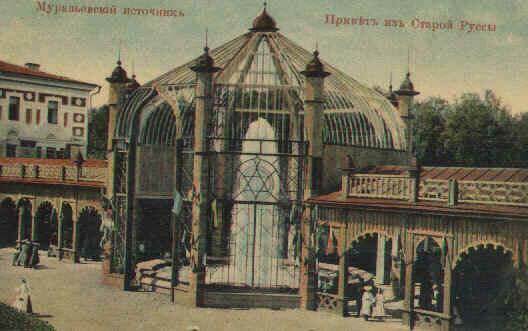 Since ancient times Russa dwellers had known about the curative qualities of mineral springs and used them to cure different illnesses. Once the doctor from Saint-Petersburg, Ranch by name, saw how adults and children were getting soiled in the mud pool. By his recommendation, the curative muds from Staraya Russa were analyzed, and the construction of the medical treatment facility with mud baths, or, mineral water institution, was started. Since the middle of 19th century, the institution became the property of the emperor's family. The excellent qualities of the water and muda, which were not worse than the famous European ones, brought good reputation to Staraya Russa. Scrofula, eye diseases, backaches and leg problems, suffocation and chest, cough, skin diseases and women's illnesses brought many noble people here each summer. Some premises of this curative institution were built for lower rank visitors. The health resort " Staraya Russa" in XIX c.
The first theatre in Novgorod province was built here for entertainment of the public. Since 1904 here performed one of the best provincial theatre troupes under the guidance of the famous impresario Konstantin Nezlobin. Plays staged by him, by reminiscences of theatre connoisseurs, were noted for good actor performance, and the repertoire was much the same as that of the best capital theatres. The troupe gave up to 5 performances a week, and there were balls held on Sundays. On the stage of Staraya Russa theatre the Russian theatre stars performed, too. The legendary actresses Vera Komissarzhevskaya, Maria Savina, Maria Andreyeva. Maria Andreyeva, was accompanied at the resort by Alexei Maksimovich Gorky. 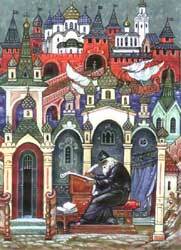 In a mocking manner, in the letter to his little son, the writer gave the following characteristics of Staraya Russa: "I am living in the town where there is not a single book shop. Instead, there are springs of very salty water coming from under the earth... I swim in the salty water, and I have become as salty as herring myself." The reminisсеnсеs of the resort town became sо unforgettable that several years later they found reflection in the novel by Gorky "Klim Samgin". 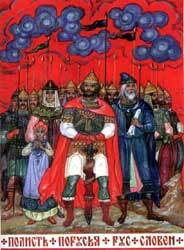 There is another depiction of Staraya Russa in the Russian literature. Our town is the location where action of the novel "Brothers Karamazovs" by Fyodor Mikhailovich Dostoyevski takes place. It is known that Dostoyevski suffered from a serious disease epilepsy. And, he had medical treatment by mineral waters of Staraya Russa. For the first time the writer came to the resort in 1872. After that, for 8 years this town became a constant recreation place for himself and his family. As he said, "the place of physical and moral peace". Their first summer the Dostoyevski family spent at the house of Roumyantsev, the priest of the St. George's church. In 1873, they moved to the separate house on Pererytitsa river. 3 years later, the family bought this summer cottage from the lieutenant colonel Gribbe, the former house owner. Later, many immortal masterpieces were created here: part of the novel "Demons", almost the whole of the novel "Teenager", the bigger part of the "Brothers Karamazovs", several issues of the writer's diary". Needless to say, how dear is this house for each one who respects the talent of this great humanist. 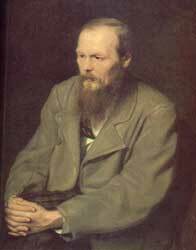 Every year, in May, in the memorial house museum of the: writer, the international literature conferences in the memory of Dostoyevski are held. For several days the leading experts who study the creations of Dostoyevski, gather here from around the world, to the shade of the willows of Staraya Russa. Dostoyevski was living a secluded life in Staraya Russa, dedicating himself to work and family. Far from the noise of the capital life, the fits of epilepsy happened to him less frequently, and were not so strong. From time to time, the writer received guests. Among guests of Dostoyevski therewere Agrippina Menshova, who was the prototype of Groushenka, Ivan Roumyantsev, the friend and confessor of Dostoyevski. As a believer, Fyodor Mikhailovich frequently went to the St. George's church. And, for sure, he happened to visit the Resurrection church where the second, more perfect replica of the miraculous icon of the Virgin of Staraya Russa was kept. This icon of the Virgin appeared in Russa miraculously - it was a gift in 1470 from the compassionate people from the Greek town Oleopol to their brothers in God, the Russa inhabitants, after they learned about, the terrible plague that took away the lives of 28 priests and 1300 monks in Russa. The priests of Oleopul sent their blessing to Russa with the icon, which they adored themselves. A hundred years later, the dwellers of the town of Tikhvin asked Russa people to let the wonder-working icon go to them, to help them get rid of misfortunes and epidemics, just in the way it helped Russa once. Russa people did not object. The Tikhvin town, which believed into the miraculous qualities of the icon did not want to part with the Staraya Russa icon. Only three centuries later, it became possible to return the Defender icon thanks to the protection of the great prince Vladimir Alexandrovich Romanov, who was cured at the resort. On 17th of October, 1888, the original icon of the Virgin was returned from Tikhvin to Staraya Russa. St. George's church, XV c.
It is definitely known that the icon was kept in Staraya Russa till June 1941. Sine then, its location is unknown. And the Orthodox believers can only guess what happened to it, - whether it had been taken abroad by Nazis, or, it has been kept somewhere in a secret storage, away from malicious people. During its long history, Staraya Russa more than once suffered from the destructive raids from the West. 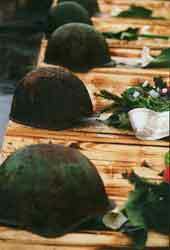 But never had it been so close to complete elimination as during the Great Patriotic war. "The town that will never be revived", - wrote Nazis on the postcards with the views of ruined Staraya Russa. Invaders did not have any mercy to the ancient town and its inhabitants. Of almost three thousand constructions, which were there before the war, only four houses survived; of 40 thousand people - only 165 people left. On the 5th of July, 1941, first bombs fell on the town. Since then, the enemy's raids continued without a stop. The invasion of German intruders to the town was accompanied by construction of gallows. On the streets, the mass executions took place. Nazis organized a garage in the Resurrection church. The cruelty of Nazis was such that citizens went to the woods, where they joined the partisan troops and revenged the enemy for their humiliated land and killed relatives. Successful operations of partisans forced Nazis to maintain substantial forces here, thus keeping them off the besieged Leningrad. On the 18th of February, 1944, the town was taken back by soldiers of the 1st Army. Those who were first to enter the town witnessed a horrible picture. The military journalist Yuri Korolkov wrote: "Gloomy February. Not a single live soul among the ruins. All is dead and abandoned... There has been no ancient town with a thousand year old history. Even among our long-suffering towns, swept over by the war, Staraya Russa has suffered the most bitter lot." Unfortunately, the war took away actually all historical monuments of the civil architecture. They had to be restored according to the remaining drawings and photographs. The diversity of constructions of 18th century and the beginning of 19th century had to be restored bit by bit. And, though today's Russa is in a way different from what it used to be, Russa's inhabitants managed to revive their city from ashes, and this is most important. Time and capital investments will solve the task of returning the beautiful original appearance to the town. Today Staraya Russa is the administrative district center.. Its area constitutes 24 square kilometers, its population is 40,5 thousand people. In Staraya Russa district there live another 20 thousand people. 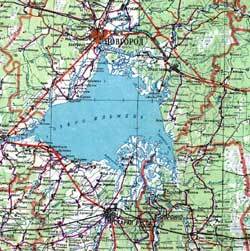 Total area, including arable land, is over three thousand square kilometers. 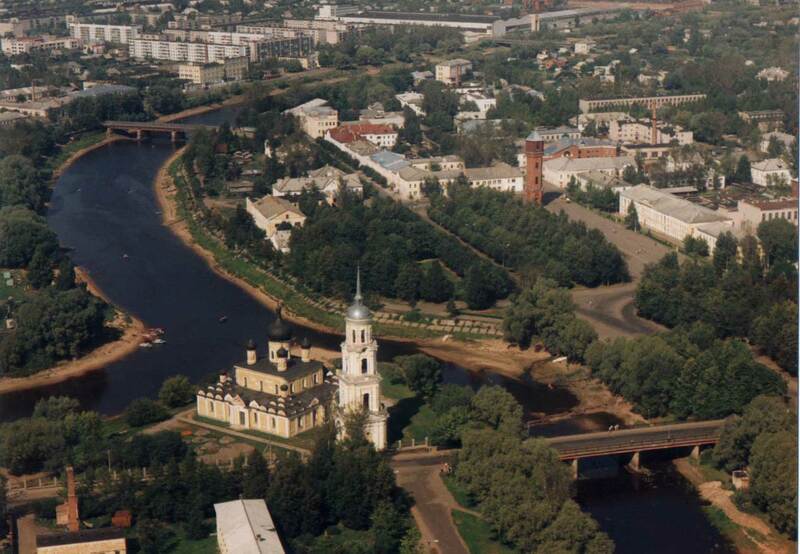 The town is connected by railroad and automobile highways with Moscow, St.Petersburg, Novgorod, Pskov, Baltic and Byelorussian cities. Staraya Russa is the third by the size town in Novgorod region, one of cultural and industrial centers of the non-blacksoil region of Russia. An organic combination of the past and contemporary features is one of attractive peculiarities of the town. Quiet, smooth-paced lifestyle of this provincial town, its clean air are so much characteristic of the Russian province. But, the health resort and large industrial enterprises, which continue developing despite the difficulties in connection with the economical reforms in the country, make Staraya Russa the town with big perspectives. The central, town developing enterprise is the 123rd aircraft repair plant, which belongs to the armed force of Russia. In 1997, the enterprise obtained the certificate of the federal aviation service of Russian Federation, which gave to the company the right to repair civil aviation equipment. The company was also granted certificates of correspondence for all kinds of operative and periodical technical maintenance of airplanes AN-12 and IL-76. The enterprise performs relatively inexpensive and good quality overhaul of aircraft of different modifications, engines for airplanes and power stations, re-equipment of military aircraft for the civil purposes, including measures for making airplane less heavy, re-equipment of the interior, and operation of aircraft at international routes. Repair of air propellers and components, of aircraft and engines is arried out. Painting of aircraft of different types is offered by the enterprise, including polyurethane paints. The plant implements the latest technologies, - computer, laser, electric erosion, plasma technologies. R&D is carried out in the area of automatization of production. The 123rd aircraft repair plant takes an active part in international aviation and space exhibitions, cooperates with companies dealing with operation of aircraft locally and abroad. 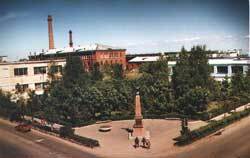 "Staroruspribor" factory, founded in 1959, is another flagship of the economy of Staraya Russa. The factory used to be the leading enterprise of the Soviet instrument-making. The public joint-stock company "Staroruspribor" remains to be the leading company at the market of Russia and New Independent States. The company specializes in production of components for boilers with the capacity of 15 kWa up to 3.15 MWa. the manufactured equipment provides for automatization of control and safe operation of boilers. It consists of control units, gas burners, sensors, valves, igniters and controlling electrodes. Now, special attention is paid at the factory to production of metering devices for measuring the consumption of heat and liquids in different branches of industry - nuclear power generation, oil refineries, public utilities. At the factory there have been developed and are successfully functioning the management system adapter to the market economy, the Quality Control and personnel training systems. At its own expense, the factory is carrying out the projects of modification and creation of new prototypes of equipment, with orientation on the leading world technologies. For several years already, "Staroruspribor" factory has been successfully manufacturing consumer goods which are demanded at the market: gas burners and boilers of different capacity for autonomous heating of individual cottages. One of departments of the factory manufactures non-standard equipment according to the drawings and sketches of the customer. "Staroruspribor" factory is a reliable partner who abides by the principle of responsibility in cooperation. 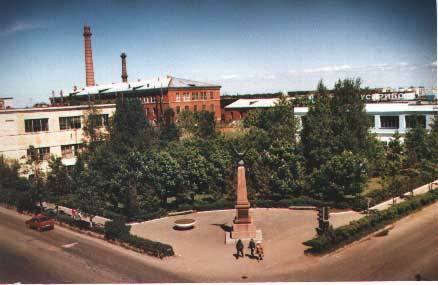 The third company in Staraya Ruysa by the size is the factory of chemical machine building, "Staroruskhimmash". The factory has the license issued by "Gosgortechnadzor", the state supervisory body, which gives the right to develop and manufacture equipment for biological, chemical, oil refinery, metallurgical and other production, made of carbon steel, alloys and titanium, where there is the risk of fire and explosions and hazardous production, and with operating pressures above 10 MPa. Serial products manufactured at the factory provide the ecologically clean production process, which has been confirmed by the ecological expertise. The factory offers its services for development and manufacturing of equipment with good quality and to the time schedule, according to the specification and the customer's project. The best in town - designers work at the factory. Devices manufactured by the chemical machine building factory function reliably and without breakdowns at hundreds of enterprises of Russia and in dozens foreign countries. Since in Staraya Russa district the agricultural sector is strongly developed, it is quite natural that the processing companies play an important role in the town economy. In Staraya Russa there arc large factories for processing meat, flax, milk, food production companies. Local authorities are doing their best to help enterprises in the complex conditions of economic reforms. The emphasis is made on the investment projects, which can support production. The favorable investment climate has been created on the territory of the district. Joint ventures are exempt from local taxes till the complete pay-off of investment projects. The former cheese-making company "Alpha", which is now the limited liability company "Lacto-Novgorod", can be considered as the example of beneficial influence of foreign investments. 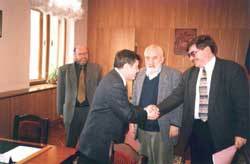 In the beginning of 1998, the Estonian enterprise "Lacto" purchased 86% of shares of the former company, and thus helped to solve a series of economical problems, increase the assortment of products, production output, improve product quality and generally improve the image of the factory. Now, «Lacto-Novgorod» produces packed and bulk milk, several types of cheese, 2 types of kefir, sour cream with 20% fat content, fat and fat-free cottage cheese, milk sugar and technical casein. Products of «Lacto-Novgorod» are in demand not only in Staraya Russa, but also in Saint-Petersburg, Moscow and many other cities in the Northwest region of Russia. 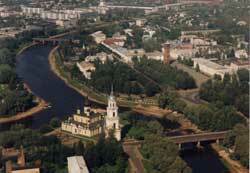 But, undoubtedly, the real pearl of the town on Polist’ river is the health resort «Staraya Russa». In September 1998, the resort celebrated its 170th anniversary. Today, It is one of the oldest and most popular resorts in Russia. This can be explained not only by the beneficial geographical location. The resort «Staraya Russa» is a complex facility. The whole family can both recreate and, undergo medical treatment here. Convenient buildings are at the service of patients. Simultaneously up to 930 visitors can be accommodated in single, double and de luxe rooms. Here patients with different diseases are treated: diseases of digestion organs, limbs, bones, peripheral nervous system, gynecological diseases. There is a large experience of curing children. Visitors who have a rest here, spend a lot of time outside, in the fresh air, swim in salt lakes, sunbathe on the well-equipped beach. The curative muda of the health resort "Staraya Russa"
Material, technical and medical base of the resort is constantly improving and developed. According to a special project, there have been constructed the mineral water gallery, water curative center, mineral water swimming pool, sports hall. The resort «Staraya Russa» now possesses 100 hectares of the natural park with three salt lakes and seasonal flood areas, mud and mineral water medical treatment facilities, polyclinic, including all required equipment and diagnostics facilities, equipped with modern equipment. By the curative properties of its mineral springs, the resort «Staraya Russa» ranks among such world-known resorts as Wiesbaden, Kreutznach, Baden-Baden. The curative properties of Staraya Russa muds are the best in Europe. 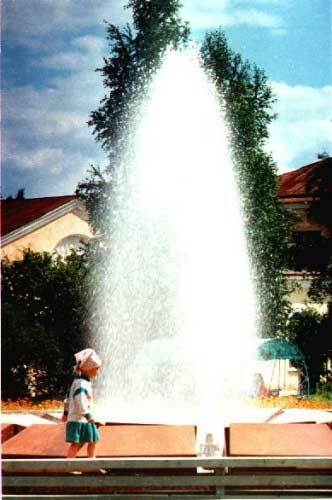 There are 9 mineral springs on the territory of the resort. Two of them are springs with low mineralization. The rest are with high mineralization. The salt lakes never get frozen all year round. They create zones with increased ionization of air in the park, a special microclimate which beneficially influences the patients. The Muravyovski spring is considered to be the symbol of the resort. It was made in 1858. The strongest in Europe natural mineral water spring demonstrates the limitless natural stock of Staraya Russa. The whole life-style of the resort, its order and environment demonstrate the high culture of this institution, care and attention of personnel to its patients. However, the Northern resort town gives not only health. It provides opportunities for a nice leisure here. You can have a pleasant and useful pastime. In the first place, the town, which, according to one scientific version, gave the name to the whole power, has a very interesting past. Each year, archaeologists go deeper and deeper into the thick cultural layer of soil in the center of the old town. By now, scientists have already found the wooden pavement, which dates back to the 12th century. The unique findings of archaeological expeditions, including the birch bark documents, make the town of Russa older and older. All these findings are exhibited, in the exhibition hall of the local regional museum. Here you can also see most interesting displays, which narrate about life and household activities of ancient Slavs. There is the art gallery located in one of the premises of the museum complex located inside the former monastery of Our Savior's Transfiguration (Spaso-Preobrazhenski). One can also get acquainted with the works of local artists in the exhibition hall, which is located in the building of the center of folk crafts and trades. Amateurs of handicraft will be definitely interested in the works of craftsmen of Staraya Russa. Lace, ceramics, items made of beads, clay, birch bark, twig and other natural materials. Slovenskoe sea, to the Life-giving spring, to the Leochnovski monastery. The local tour agency offers group tours around the historical places in Novgorod and neighboring Pskov regions, with visits to the ancient kremlins, Pskov and Pecherski monastery, Izborsk, Pushkin national park. Adorers of Dostoyevski can visit the memorial house-museum of the writer and go on an interesting excursion around the places connected with his novels written in Staraya Russa. In the local museums and art galleries, visitors can buy paintings, handicraft items, different souvenirs reminding of the town and the resort. Those who like to spend time in the fresh air, can enjoy an exotic real in the most picturesque hook — the hunter's log house on the lake. Here it is possible to hunt and fish all year round in the Russian way: to hunt a bear, a moose, a wild boar, to hunt a hare with hound, to hunt a wolf with flags, a wood grouse or a black grouse, to go with a gun for a woodcock. After hunting and fishing, you' are welcome to the recreation base with the Russian steam-bath, swimming-pool, sauna. Many things in Staraya Russa attract and enchant visitors who came here once. Having visited our small provincial town, you will definitely want to come back again to the quiet streets and alleys. 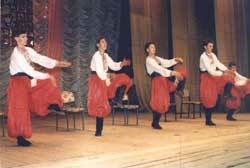 Each year the cultural sister-city relations of Staraya Russa become stronger. It has friends not only in Europe and Scandinavian countries, but also on American and Australian continents. And when the big friend of Staraya Russa, academician Dmitri Likhachev was asked by Russian immigrants, where they had to go «to breathe in the motherland» and «where Russia could be seen», he answered: «Come to Staraya Russa!».